Before you commit yourself to buying an existing home, it is wise to have it inspected. A home inspector is a trained professional, who will take anywhere from 2.5 to 3 and sometimes more hours to check the many components, from the basement up to the condition of the roof, that make the home functional and safe. After checking all the elements, the inspector will produce for you an inspection report. This report will point out all the present or potential problems, and give an approximate cost to fix the defects. 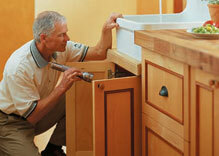 A good inspection report will also give you a basic home maintenance schedule. If at all possible, you should be present during the inspection. Most good home inspectors will encourage you to follow them around. This will give you a chance to see the problem areas, and to ask questions. You will also have a chance to find where the important elements, like a water shut-off valve, are located, and to get maintenance tips. After having the home inspected, you will be able to make an educated decision to proceed with the purchase, or, if there are serious problems, negotiate to have them rectified or abandon the deal. For your convenience, below are the two home inspectors that are found in the Jonesboro/Paragould Yellow Pages. Sitemap | Real Estate Website by Myrsol, LLC.